The Masked City is another fantastic adventure chronicling the exploits of Irene Winters, a secret agent for an interdimensional library. I literally cannot find anything to dislike about the last part of that sentence. In fact, the only reason I’m not rating this higher is because of the reduced time we get to spend within the said interdimensional library, as well as some of the supporting characters (and if you recall, those were the elements I had wanted get more of out of the previous volume as well). Still, it meant we got to see our protagonist grow into her role and develop further as a character, and I was happy to see this sequel tap into the same fun adventurous vein which provided the drive for The Invisible Library. When the story begins, Irene is a Librarian-in-Residence, having earned her position as an agent in the alternate version of London that we saw from the first book. She is in the middle of working on an assignment when all of a sudden, her apprentice Kai is kidnapped. With the help of her detective friend Vale, Irene is determined to uncover the mystery of who took Kai and why, unaware of the dangerous path this will set them on. For time immemorial, forces of Order and Chaos have remained locked in conflict. The mighty dragons representing the former are always at odds with the Fae which represent the latter, fighting for control over the many worlds that exist in the multiverse. However, some worlds are inherently high in Order or Chaos, naturally predisposing them to one faction or the other. Irene has reason to suspect that Kai has been taken by Fae to one of their worlds, which would mean disastrous consequences for her apprentice if he is not recovered soon. To save Kai, she’ll have to go undercover and infiltrate an alternate Venice, reputed to be the masked city because every day is the Carnival there and the party never ends. Deep in the heart of Fae territory where Chaos is so thick that even the great Library cannot help her, Irene has only her own skills to rely on to find and rescue Kai. 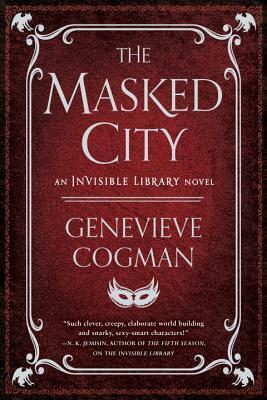 In The Masked City, our heroine goes full-on secret Library spy, using all her knowledge of Language and subterfuge to survive a cutthroat world where the Fae are manipulative and merciless. We get to see her gain confidence and set aside the doubts that plagued her in the first book, where she constantly worried about her competition or questioned whether she deserved such a high profile assignment when she was only a junior Libarian. For one thing, this is Irene’s mission and her mission alone; Kai is not only her apprentice but her responsibility, and that’s not something she takes lightly—even if it means she will receive no help, and failure could cost her everything. The story continues to be fast-paced and entertaining. The books in this series make for light, fun popcorn reads, and this sequel once again delivered exactly what was promised. Cogman further develops the world, expanding upon the role of the Library. She also fleshes out the conflict between the Dragons and Fae, and delves deeper into the lore of both sides. More importantly, we get to learn more about the motivations of these factions, whereas we only got to scratch the surface in the first book. Some questions are answered, and more mysteries are also introduced. I love how this series is full of potential, and we’re just starting to explore the many possibilities. Our characters’ journey to this book’s astonishing version of Venice is a prime example. That said, my only regret is that we didn’t get to see much of the Library itself. Also, Kai spends the bulk of this book kidnapped and imprisoned, so we didn’t get to see much of him in action at all, which is a shame because he was my favorite character from the first book (for reasons I can’t go into in this review, because if you haven’t read The Invisible Library yet, it would be a spoiler!) However, these are just minor issues based on my personal preferences; beyond them, it was difficult to find much fault with this sequel. Once more, I am happy to recommend this series to all bibliophiles and fans of “books about books”. As a book lover, I also saw a lot of myself in Irene, who just can’t help but feel an affinity to all things literary and bookish! I really enjoy the characters, the story, and the concepts. I’m really looking forward to the next book, The Burning Page. I like the title of the next book 🙂 Hope to start this series one of these days. I think you’d enjoy this – both books have been quick and fun, perfect for some light fantasy reading. I’m happy to hear that the protagonist grows and comes into her own in this book, since I’m just about to dive into The Invisible Library! Bookish heroines and heroes are always a delight, but add to that a magical library and you’ve got an irresistible combo. Hopefully the characters spend more time actually inside the library in the third book! Haha, “magical library” is probably one of those buzz terms that will ensure I will read your book. I hope we’ll get to spend some more time at the invisible library too, because what I’ve seen of it has been awesome! I need to give this series a shot. Sorry that the second one wasn’t better than this though. I can definitely see how it would be disappointing to not spend all that much time in the inter-dimensional library. That’s the main draw for me to this series. Yes, I get chills just thinking about “secret interdimensional library” – I hope we’ll get to see more of it in the next book! I’m enjoying this series – it is light and fun now you come to mention it and it’s great for reading between the more mind bender type books! This is a great fun book and I am looking forward to The Burning Page!